The MicroLux® is more powerful, more accurate, and smoother running than any other saw its size. 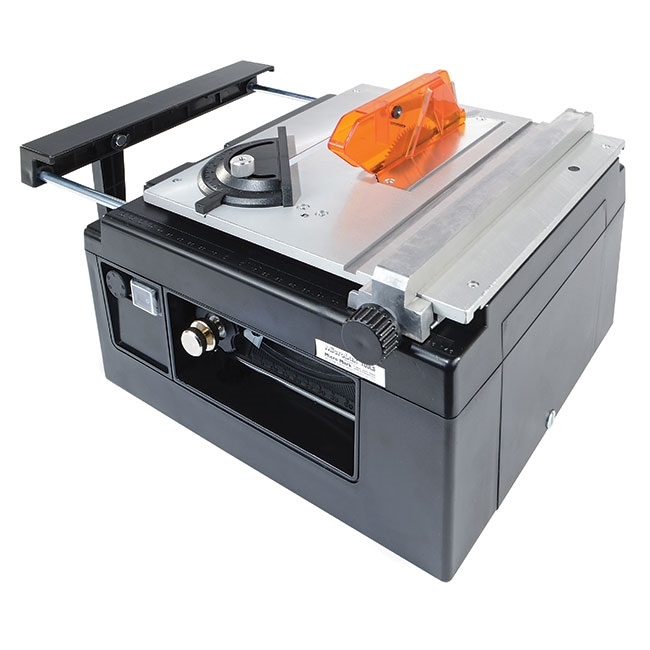 And it's the world's first variable speed table saw, so it will cut metal and plastic, as well as wood. This is, without a doubt, the most feature-packed machine ever designed for the scale modeler. Includes a self-aligning rip fence, calibrated miter gauge, blade guard and an 80 tooth fine cut blade for balsa and basswood up to 1 inch thick, hardwood up to 1/4 inch thick (hardwood up to 1 inch with optional carbide blades . . . to purchase optional blades, see below). Blade dia. 3-1/4 inches with 10mm hole. If you care about precision and are serious about producing quality work, don't delay, order your MicroLux® saw today. High torque, electronically rectified DC motor produces more torque and power than many motors rated at 1/2 hp and higher. And torque remains high, even at low rpm. Variable speed, from 3,600 to 7,000 rpm. 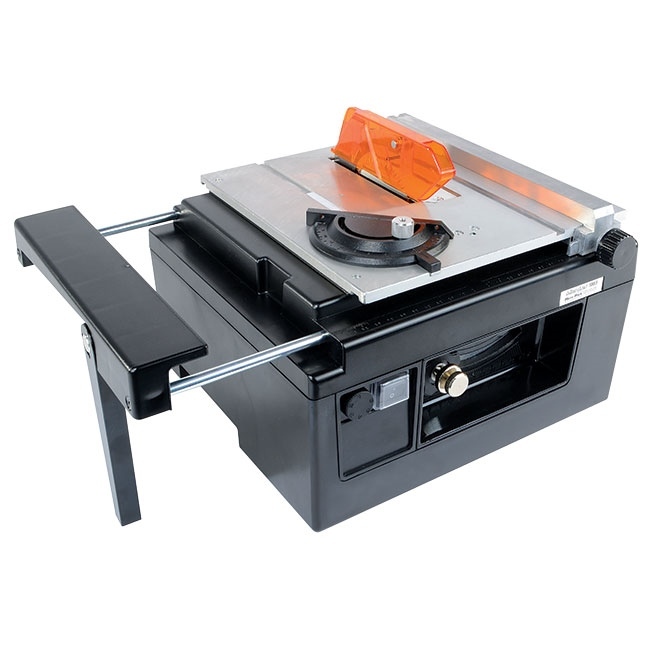 Lets you cut plastic, aluminum, brass and other non-ferrous metals without overheating. Tilting arbor for angle cuts up to 45 degrees. Cuts a full 1 inch at 90 degrees, 3/4 inch at 45 degrees. Blade height adjusts from 0 to 1 inch. 11-1/2 inch x 9-1/2 inch table with 9-1/2 inch x 9-1/2 inch machined aluminum surface. Two miter gauge slots for cutting from left or right side of blade. No-slip timing belt for more torque. Up-front controls for on/off, speed, blade height and tilt. Table extension for cross-cutting long sheet stock. Plugs into standard 120v AC outlet. Compact size. Only 10 inches long x 11-1/2 inches wide x 7 inches high. Weighs approx. 11 lbs. Similar to Proxxon model FKS/E. 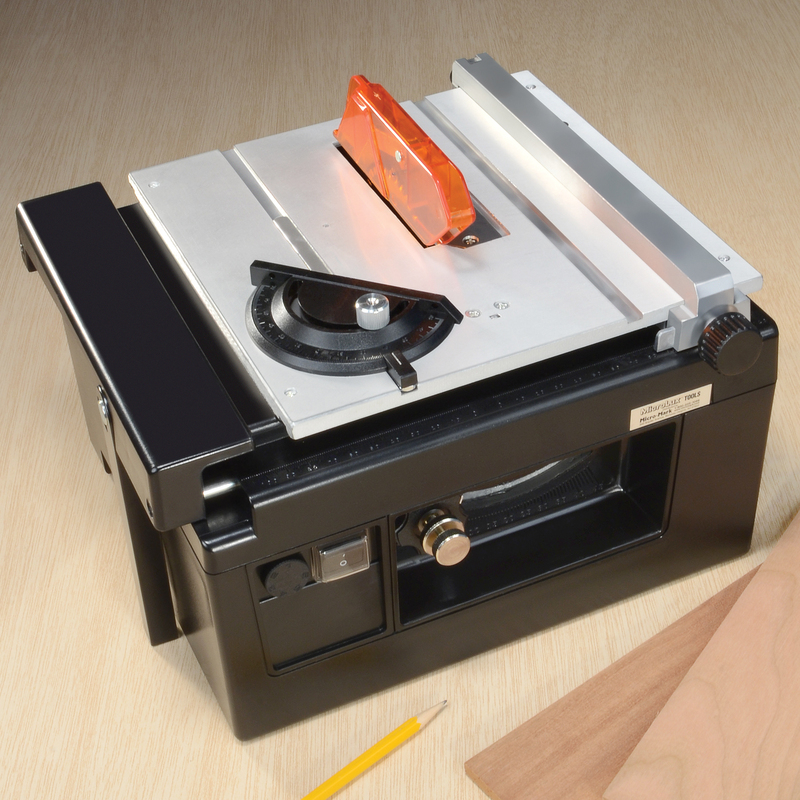 Order the MicroLux® Table Saw in the usual way by sending full payment or charging to your credit card. Then examine it risk-free for 30 days. If you decide not to keep it for any reason, simply return it (in resalable condition, please) via courier or insured Priority Mail for an immediate refund. I just have to say that all the advertising you see in the Micro-Mark catalog is correct. I have used this saw for several years and I love it. I would order another one in a heartbeat if this one ever quit. It is just great for small projects. I build dollhouses and furniture to fit in them and many boxes. It is probably the best tool I have purchased (and I am 71). I bought this saw about 10 years ago and it has worked flawlessly ever since. I've cut plastic, thin brass, hardwoods (up to 1/2 inch) & plywood (up to 3/4) with it and had no problems. I really like the fact that it is variable speed (although plastics can still tend to melt a bit along the edge). I bought the table saw, a complete set of blades, dado cutting system, blank blade plates, taper jig, and the ripping gauge set (that new Super value package was not offered back then). The only Item I've worn out is the blank blade plates - that reminds me I need to order another set. I bought this little saw at least 12 years ago and it worth every single penny I spent on it. Cut 3/4" wood/plywood, 1/2" plastics with no problem. I even cut 3/8" aluminum flat bar with few passes. Love it. I’ve been using the saw for many years now and still running strong. I build giant scale RC planes and use this saw for cutting several different types of material from plywood, plastic, brass and even G-10 fiberglass. The G-10 up to about 1/8” and up to about ¼” plywood. Since I use many different types of material, I change out the blades often. Really easy to do. I never really timed it, but I don’t think it takes me more than a few minutes to change a blade. The speed adjustments help as well with different materials. Also, the vacuum attachment in the rear really helps to reduce dust. I big difference when I forget to turn my vacuum on. I probably push this unit to its maximum, but it hasn’t disappointed me. Definitely a primary “go to” tool in my shop.